NEO¢, the latest product from British LED manufacturer Rotolight, is a revolutionary on-camera or location LED lighting fixture designed for the most demanding of professionals. NEO¢ includes several industry first features that set it apart from the field, notably amongst which is an arsenal of Cinematographic Special FX, (or CineSFX¢), providing customisable creative visual lighting effects, for use on set or location (Strobe, Lightning, Fire, Cycle, Throb, Police & TV). Visual FX Veteran Stefan Lange (James Bond Spectre, Batman, Notting Hill) was keen to put NEOs CineSFX mode through its paces, and arranged a test shoot on set at the Sony Digital Motion Picture Centre at Pinewood Studios, with their latest 8K F65 camera. My background is in visual FX, I started off working on films like Brazil and Killing Fields and my career went right through Batman, a couple of Tomb Raiders, Notting Hill, Seven Bond movies, it's quite specialized work said Lange. The CineSFX mode thats built into the Rotolight NEO is an advantage to any production. Its fast - it doesnt matter if its a feature, a drama or a documentary, its always going to come out and fill that little bit of shadow, and add that little effect. There isnt a job I wouldnt take it on. NEOs CineSFX mode has enabled previously costly and time consuming production effects such as fire and lightning FX to be easily recreated, with precision and control, in a highly portable, battery powered LED light. Each effect is customizable, allowing control of the speed of the effect, peak levels and colour temperature, whilst trigger mode allows complex effects to be action ready at the click of the button. Before NEO, I would need several lights and filters, to modify the quantity of the light, the colour of the light, and certain functions of the light I would need specialist boxes and electronics, but with NEO, its all built in within one unit, and its still small enough to fit in my pocket! NEOs Bi-Colour LED system with AccuColour¢ delivers exceptional colour rendering (CRI:95+), and fast, tunable colour on location thanks to the accurate colour temperature display (CCT). Powered by 6 x AA, AC, DC or D-Tap, NEO¢ gives Industry leading performance (1077 Lux at 3 feet) whilst providing a gorgeous soft light source and Rotolights signature Ring-Light Effect. 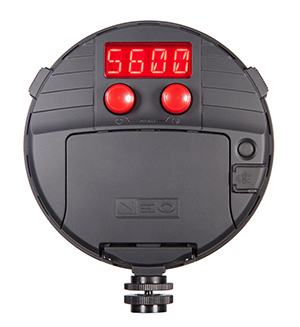 Dual Controls for both dimming and colour make NEO¢ a highly versatile solution for run-and-gun news shooters, filmmakers or still photographers. The Rotolight NEO is my new go-to choice of lighting - a lamp I take on every production. Theres no other light that does so much in one unit. Its small enough for tight spaces but powerful enough for a multitude of situations. With the built in CineSFX functions, it can replace otherwise time and budget consuming equipment and bring to the set sophisticated lighting effects which would often have been unaffordable. Cable-free, cool to the touch and light enough to easily hang or hold, the Rotolight NEO really speeds up lighting on-set or on location said Lange. Delivering powerful performance in a compact package, NEO¢ can be a secret weapon wherever a key light, fill, extra kick or catch-light is needed. NEO¢ includes a belt pouch, power supply and 4 piece Filter Pack including Diffusion, Skin Tone and Magenta. The Rotolight NEO 3 light kit favoured by Stefan Lange, includes 3 NEO lighting fixtures, 22 filters (including diffusion, skin tone, magenta and colour FX), compact lighting stands, hot-shoe adapters, 360 ball head swivels, and power supplies, all of which fits into an injection-molded, impact-resistant case, which includes wheels and retractable handle, ideal for airline travel. You can watch Stefan Langes interview NEO here https://youtu.be/hcQfY-Ay57s Rotolight NEO is available to order now as a single light (£249ex) or 3 light Kit (£1082.50ex) now from www.Rotolight.com (01753 422 750) or to hire from Alias Hire (www.aliashire.com). Since its launch at NAB 2015, it has been hailed as the next industry standard by Simon Edwards of the Guild of Television Cameramen, honoured as a finalist for the IABM Gamechanger award, and won a 5 star highly recommended plaudit from Pro Moviemaker magazine.